CG Channel is on holiday this week. While we’re away, check out five tools that caught our eye this year but somehow we never managed to cover. 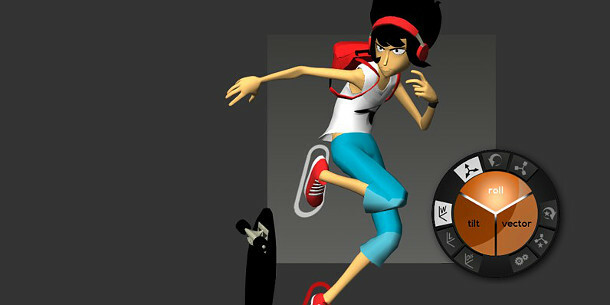 Today: an animation system that aims to rethink the rigging process. Originally posted on 24 June. Scroll down for updates. From an established commercial technology, we move to one still in development. Unveiled publicly earlier this month, Akeytsu, Nukeygara’s next-generation animation system doesn’t go on sale until October. There isn’t much information about Akeytsu yet – not even a demo reel. So why feature a tool that most people won’t be able to see until Siggraph? Because Akeytsu aims to reinvent rigging for artists, not TDs. A next-gen rigging and animation system for games and feature work. It’s designed for artists, not engineers, with a focus on “simplicity, velocity and ergonomics”. The name is a pun on the Japanese for ‘dragonfly’. A lot of cool features are promised: Pixar-style mesh controls, an IK solver that plugs into the FK skeleton without switches, and a smart 2D manipulator that replaces fiddly 3D gizmos. Nukeygara also claims that Akeytsu rig hierarchies are five times shorter than conventional animation tools. Too good to be true? We’ll have to wait and see. But Nukeygara co-founders Aurélien Charrier and Yannick Rousseau have two decades’ experience in the games industry, so they certainly have an inside perspective. Too early to say. We’re aware of developers working on technologies that aim to do similar things, but so far, none of them have been announced as a commercial product. In theory: fast, artist-driven workflow, lightweight rigs, and an ergonomic UI. Find a broad overview here. Judging by the screenshot in this article, it’s a standalone application. How it integrates with other 3D software hasn’t been confirmed yet. Nukeygara will be exhibiting on the Cap Digital booth at Siggraph 2014 this August. Updated 21 July: Nukeygara has posted the first public demo of Akeytsu. You can see the GUI, manipulation controls and FK workflow in the video above. IK workflow will be shown in a future video.